« Exciting News from Pinterest! 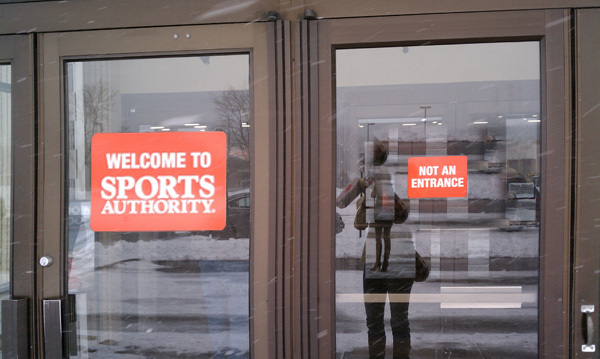 The two equally sized signs seemed to have conflicting messages: “Welcome/Come In” and “Not an Entrance/Get Lost”. I literally had to study the handles on the doors to determine what I was expected to do. Eventually I figured it out, but I was still left with a rather jarring sense that I wasn’t wanted here. The problem with these signs is that they failed to communicate a hierarchy. 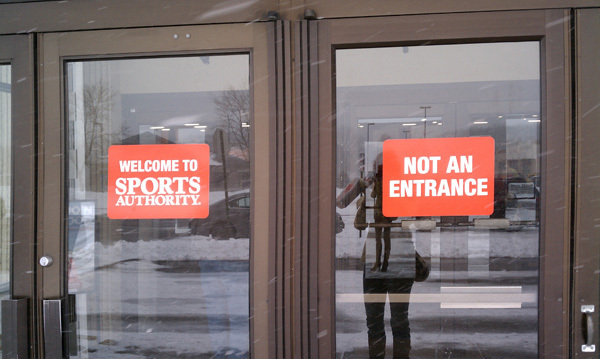 Yes, it’s important that folks not get smacked with customers exiting the door to the right, but it’s MOST important that customers feel welcomed into the store using the appropriate door, right? This example clearly welcomes visitors to the left door, while also appropriately discouraging use of the incorrect door. The message is quickly read and deciphered and the visitor feels welcomed. Make sure you consider hierarchy in the design of everything you present for your company. Know which messages are most important to communicate quickly to your audiences and make sure graphic layouts support those messages! This entry was posted on Tuesday, March 19th, 2013 at 8:20 am and is filed under Design Tricks and Tips, Uncategorized. You can follow any responses to this entry through the RSS 2.0 feed. You can leave a response, or trackback from your own site.